Thanks ever so much - we absolutely love the new stained glass windows! Every time we're in the hall or kitchen we can't stop thinking how amazing they look! We even had a card through the door this morning from one of our neighbours saying how beautiful it all looks - "like a work of art" in their words! AN EXCEPTIONAL SERVICE RECEIVED! From initial enquiry through to installation, our experience with Designs in Glass was exceptional. Mark and Debbie worked with us to design and create 4 stained glass panels for a pair of pocket doors, for the entry way in our home. We received an excellent level of service, they were upfront about the cost, we had the opportunity to select each piece of glass and they were communicative throughout the process. Outstanding quality, creative design and a now beautifully complete home. Thank you so much. ..... am absolutely thrilled with what you’ve done. Many thanks indeed - you’ve done a really excellent job. It looks stunning. I can't get over what a fantastic job you have done. Many thanks. We will enjoy it for many years to come! We have just collected our two oval stained glass windows that we commissioned from Mark and Debbie. They are absolutely beautiful and are everything we hoped they would be - the workmanship is fantastic. Mark and Debbie are very welcoming and happy to discuss thoughts and ideas and will make suggestions to improve the designs. A very professional service and we would highly recommend 'Designs in Glass'. Thank you so much again for the fantastic job you did. The window looks amazing and one can easily see how much care and thought went into the production process. We can't be grateful enough. I am not sure how often we need stained glass repaired in our house, but I will make sure I recommend you and Debbie as often as I possibly can. Just to say again how delighted we are with the windows. They are just beautiful and transform not only the door but the hallway as well. Thank you so much. We are absolutely thrilled with the windows, thank you again!!! Thank you for all your work today. The windows look beautiful. Mark and Debbie made and fitted glass panels in a door for me in my Edwardian terraced house. I am *delighted* and I recommend them very highly. The result is beautiful. They put artistic flair into it, while still managing to listen to what I wanted and to fit their design to my vague sense of what I was asking for. And the craftsmanship in the installation was perfect. Their work is highly professional, with artistic flair. It has been almost a year since we had the glass in our 1930s front door replaced by Mark. Since then not a day has gone by when I have not thought to myself that ‘this was one of the best jobs that has been carried out in our house’. The stained glass has not only improved the overall feel of the hallway, making it more interesting and providing a beautiful array of colours when the sun comes through but has also restored an original door into a beautiful entrance statement. The colours and textures carefully chosen by Mark match the original perfectly. Mark had us involved in the whole design process and checked that we were happy with everything throughout the design process. He was extremely reliable and his price was very competitive and went above and beyond in terms of the time he spent with us and the attention to detail. This was by far the best customer satisfaction experience I have had in a long time. Something that seems hard to get these days. It looks absolutely splendid. Thank you so much. It has more than lived up to our hopes. Can't wait till Saturday morning to see it in daylight - though it's splendid enough now. Off to stand outside again and look in at my dream door! ... it exceeds our expectations, you have done a very professional and beautiful job. We would be delighted to be references for you, not that I am sure you need them... Thank you. I am so pleased with the new Windows in my front door. They look as though they've always been there yet are obviously contemporary - exceeded my expectations by a long way! Thank you so much for the magnificent piece of work! We're both so impressed how beautiful the doors are. I keep them shut most of the time so can enjoy the view. Not very practical but sooo satisfying! ;-) I smile every time I look at them. Started thinking where else we could put stained glass in the house ;-) Thanks again! It was such pleasure to work with you...... The doors are the most beautiful asset to our deco - and bring us lots of joy, lots of speechless visitors. Well, it went up this morning and it looks wonderful. We can't thank you enough for a fantastic piece of work. It's superb. We are delighted with the work you have done, It's such specialist delicate and skilled work you do and so glad we found you. I wouldn't hesitate to recommend Mark and Debbie's wonderful work - helpful, patient and supportive through the whole designing process and with fantastic end results - a beautifully made piece that's transformed a window with no view into a lovely focal point - thank you both so much. Thank you very much for all your help and advice and for installing such a beautiful stained glass on our entrance door. We are very happy with it. Mark, the windows looks wonderful, I am glad it's done and very grateful for your excellent work, many thanks and kind regards to you and Debbie. Once again, many thanks for your excellent and prompt work. All up to your usual high standard. I’m sure you will hear from us again in the future. Just to thank you again for the fantastic stained glass and for taking so much time and trouble over it. It's everything we'd hoped for and more. The light it casts into the bathroom when the sun's behind it is mesmerising. We'd wholeheartedly endorse your work; the experience has been a great pleasure from day one. We are very, very pleased with the results of your work! This is just a short note to let you know how pleased we are with the stained glass in our front door. The colours and the design have worked out really well and it's a real addition to the house. Thank you for the care you took in the detail – the result is really a delight. Very many thanks for repairing our porch windows so expertly – it all looks so much better. I am sure we will be in touch with you again! I thought you might like to know that our son, normally the harshest critic of any work we have done on the house, was home last weekend. His comment on the stained glass repair was, basically, “Wow.” Praise doesn't come much higher than that! Thank you so much for making up the panels for us and for all your advice and help in choosing the colours. It has been fascinating to watch the windows change over the course of the day and evening and then to wake up to them this morning with the sun coming through them. We are really going to enjoy living with the new addition to our home. Many thanks once again. We couldn't be more pleased with the end result. I had some very good advice from Mark as I was planning to have stained glass panels made up and fitted into a upvc front door and fanlight. Stained glass, as he told me, is designed for wood doors but as I had upvc the stained glass had to be encased inside double glazed units. He and Debbie painstakingly went through my designs and choice of colour and must have put hours into this job for which I will be eternally grateful - nothing was too much. I can't stop admiring my beautiful new door! I love the panel you have made for our door. It is exactly what I wanted and the glass in the roses is fantastic! I wish we hadn't waited for 15 years to do this! I really appreciate all the advice you gave on the glass and the care you took in turning my picture into reality. Thank you very much indeed - brilliant report . You can be assured that for future work we shall be back in touch. A very, very big thank you. We appreciate your skilled work. Thank you so much for repairing our stained glass panel, it really does look lovely hanging in the hall. I am really pleased with it ... Very many thanks for all the trouble you took over it. It has a new lease of life now. Thank you so much for all the time, thoughtfulness and care you put into producing the wonderful stained glass panel for me.... It was a great experience working with you both, sharing ideas and skills (yours!). Just to say thank you for the fantastic repair job you did for us! Our little glass shade looks wonderful in situ again! A relatively small commission for Mark, but he provided a very personal and helpful service, taking the time to send us various prototype designs and even photos of how they would look in place once made. I appreciated the help in choosing the types of glass and the colours for each component and always felt very confident in the final outcome. Now we have a beautiful new front door, many thanks! 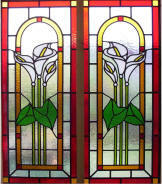 We commisioned Designs in Glass to make a stained glass panel for a 1930's front door. We wanted to keep the facade of the house true but with a bit of personalisation. We decided on a snowdrop as the theme for the panel and drew (not vey well!) what we thought we wanted and emailed it over. Mark duly returned the design, drawn properly this time, with a couple of options. We then visited the workshop to choose each individual colour for the diffent sections. Whilst we were pretty sure in our mind exactly what we wanted, both Mark and Debbie were keen to offer advice based on their vast experience. This advice proved invaluable as the end result was so much better than we could ever have hoped, a truly beautiful door that transformed the front of our house. We have received many compliments on our new door but I think the best testament is the fact that the Lady of the house managed to scrape her car on the wall when parkingup the drive as she was too busy admiring the door that was already a couple of weeks old. Mark and Debbie are a lovely couple who listened to what we wanted and delivered a piece almost identical to our original design. They were ontime with delivery and very easy to work with. It's just a shame we only have one front door. We had several badly broken stained glass windows at our church's premises in Wooburn Green. Mark gave us useful practical advice and several options for full versus partial rebuilding - all very clearly explained and priced. The end result was excellent: a combination of rebuilt and repaired windows with carefully matched replacement glass where required. All done on time and to budget. Can't recommend too highly - we would certainly use them again. The window is fantastic!! We love it. Thank you very much. Thank you for all your hard work. We're over the moon, it's better than we expected. I have seen the doors and they are truly lovely! Thanks so much. Thanks very much for your help and the great attention to detail that you've given this piece. Your window is fantastic - we love it. Thanks for matching the pattern too on the wavy glass - very much appreciated. Thanks again for your time. It's really a beautiful piece of work. I am very pleased with your work, it has been a pleasure to deal with you and you clearly take pride in your work. I'm sure we'll be seeing you again. Dear Mark, thank you for all your hard work and a super job! I would like to say that we are delighted with the work, and at its speedy and prompt completion. Many thanks. We are absolutely thrilled with them. So, thank you for making them so well for us. Many many thanks for the very beautiful glass you put in my rather dirty old front door. I LOVE it and I will clean that door, soon. Thanks again for a fabulous and professional job. And thanks again for everything, we both really like what you have done and the finish is great. .....both I and my daughter will definitely be recommending your business to friends - and we very much look forward to meeting you at one of the craft fairs. THANK YOU so much for an excellent job..... The standard of your work is first class, but above all your caring attitude has made the whole process very easy. Thank you so much...I'm so impressed with your swift efficient service so I will definitely recommend your business to family and friends looking for something special. It is beautiful and I am totally in love with it!!! Thank you for an excellent job and to time...we have no objection to you using the photographs in your publicity. You did a very good job and might as well boast about it! Many thanks again for all your work on the window, which I'm really delighted with. All the windows are looking fantastic!! The little dishes are STUNNING! Thank you so much. With thanks for an excellent job. We are still extremely happy with our window and everyone who comes to visit thinks it is fantastic!